Hello friends, I hope you all are doing great. In today’s tutorial, we are gonna have a look at detailed Introduction to DS1307. 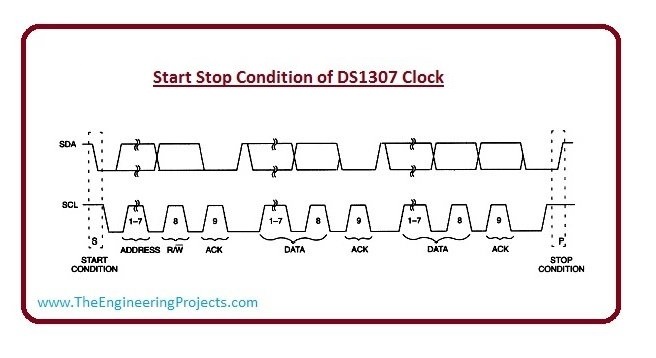 DS1307 is a real-time clock. It is a low power device and also has battery backup, which provides power when its external power supply not working or is off. It works on the I2C protocol. It is a bidirectional device and it can send and receive data on both sides. 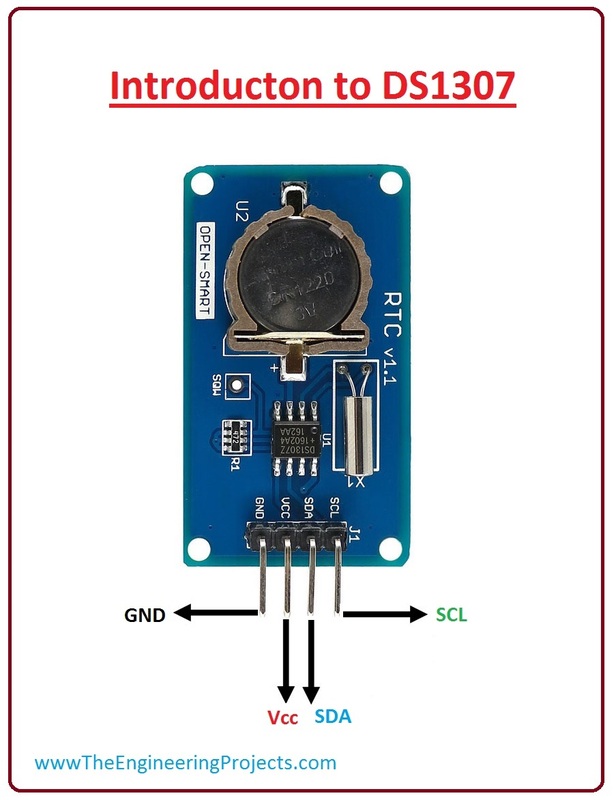 DS1307 is a Real-Time Control (RTC) IC. In DS1307, data is transferred in binary decimal coded, bits pattern. The data transfer rate in DS1307 is 56 bytes. The memory which is used in DS1307 is NV SRAM. NV SRAM is basically a non-volatile random access memory. In working, NV SRAM is quite similar to static random access memory(SRAM). 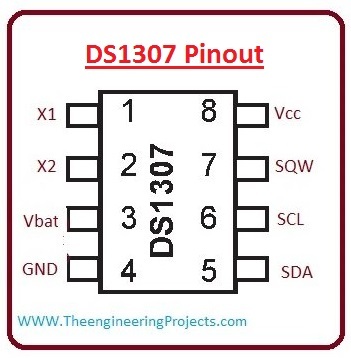 DS1307 is an electronic device which plays an impotent role in real-time embedded systems. In embedded systems, we can get benefits of system clocks, students attendance time and date, we can also use it as an alarm for special work. DS1307 consists of a built-in power-sense circuit. The purpose of the built-in power-sense circuit is that if power gets cut-off, then it will automatically switch to back up power supply. In this way, our circuit remains in working condition. The protocol on which DS1307 works is I2C. I2C is a single line protocol in which data is transferred bit by bit along a single wire. PIN 1,2: These pins are for standard 32.768 quartz crystals. Both pins can be used as input and output for internal oscillator. If X1 is input then X2 is used as output. PIN 3: This pin is used for battery connection to DS1307. PIN 4: We have to apply Ground on this pin. PIN 5: This pin is labeled as SDA, which is short for Serial Data Line. PIN 6: It is used for serial clock input (SCL) and data synchronized. PIN 7: This pin is used for output square wave obtainer (SQW). PIN 8: At this pin, we provide an external power supply (Vcc). I2C is a serial protocol in which data is transferred bit by bit. I2C combine the best feature of SPI and UART. By using it with one microcontroller we can control many slave devices. In I2C data is transferred in the form of messages, then we convert messages into data form. Each message has an address frame that contains a binary address of devices which under control. I2C protocol is cheaper to implement then SPI protocol. SPI control one slave device while I2C control more than one device. 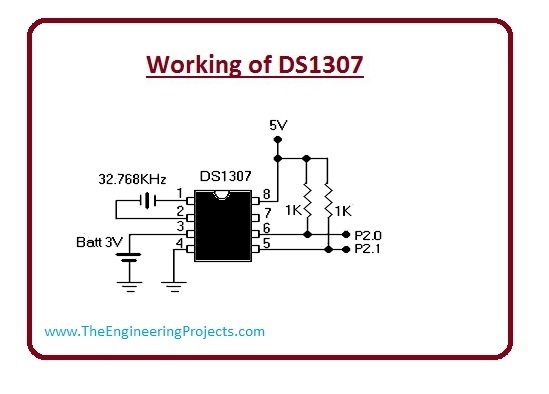 For a better understanding of the working of DS1307 let’s discuss a circuit in which we use it. In this simple circuit, we connect its first two pins which are X1 and X2 with 32.768 kHz crystal oscillator as the source for the chip. The third pin is connected with a battery of 3V. At Vcc, we give 5v supply and it can be given by using a microcontroller. If Vcc is not provided then read and write condition are inhibited. Starts and stop conditions are required when one device wants to communicate with other devices in the I2c protocol. For obtaining start condition we provide specific identification and address register to a device, by this, we get start condition. For a better understanding of stop and start condition lets have a look at clock figure. Let’s have a look at Feature of ds1307. In this section, I have designed a table where I have placed all features of DS1307 along with their symbols and units. These are some applications of DS1307, Lets disuses them. As we know DS1307 is used to tell continues time and date showing purpose, that way it is an electronic device such as a computer, mobile, and laptops. By using it with Arduino we can use it in several projects related to data logging, alarm, clocks, etc.